1. Intuitive- It must be easy to understand and use without documentations. 2. Stable- Not only it should be running but with good performance too. 3. Demands - Creating useful functionally, no matter how nicely your API is documented, how easy it is to use, it people don't need it, they won't call it. Simply but concrete naming for the URI. Common rules, use nouns instead of verbs, that describe the content the API is providing, such as customer, account and product etc. In Camel the place to define it is in the REST DSL, it allows developer to define REST services in it's application. Define the name of the API in the URI and have several layers of API description. From the architectural stand point, one of the good thing about Camel and Fuse/Fuse Integration Service. You naturally create these independent chunks of service, that either connects to a datasource (or multiple if you want, but that does not quite fit in the sprits of doing microservices.) and then becomes a microservice. 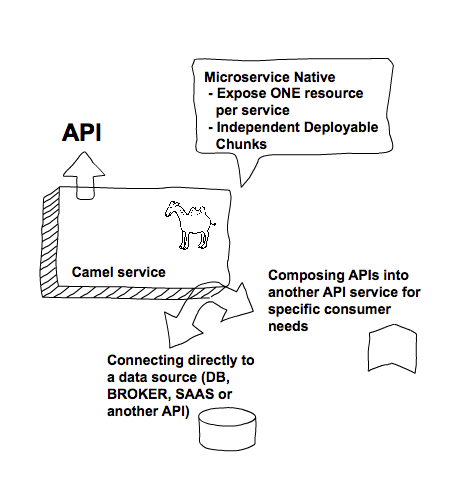 Or you can use it to create a service that compose/orchestrate APIs for the consumer. Not only it eliminates the whole team to agree upon naming of the actions, and since it's globally recognized standard, consumers will find it easier to understand. Wrapping your own error is good, but think about this, when a consumer gets response from the API, what is the first content it get? The HTTP response header, instead of processing the entire payload (not restricting to error, there are several successful status code too). Standard response for successful HTTP requests. The actual response will depend on the request method used. I don't believe in ONE SIZE FITS ALL data model when it comes to providing information to various consumer, the amount of information can be shown in a mobile device screen, an smart watch or a desktop computer is definitely different. Camel has capability for you to automatically transform the data from POJO into the format that you wanted by specifying the output, or you can simple so marshaling with various data format Camel supported or do a little extra processing with the Data Mapper transform component. Binding is turned off. This is the default option. Binding is enabled and Camel is relaxed and support json, xml or both if the needed data formats are included in the classpath. Notice that if for example camel-jaxb is not on the classpath, then XML binding is not enabled. Binding to/from json is enabled, and requires a json capabile data format on the classpath. By default Camel will use json-jackson as the data format. See the INFO box below for more details. Binding to/from xml is enabled, and requires camel-jaxb on the classpath. See the INFO box below for more details. Biding to/from json and xml is enabled and requires both data formats to be on the classpath. See the INFO box below for more details. One of the nice handy little tricks when doing API in Camel with REST DSL, you can simply integrate it with Camel swagger java components. It will expose the API in swagger format. 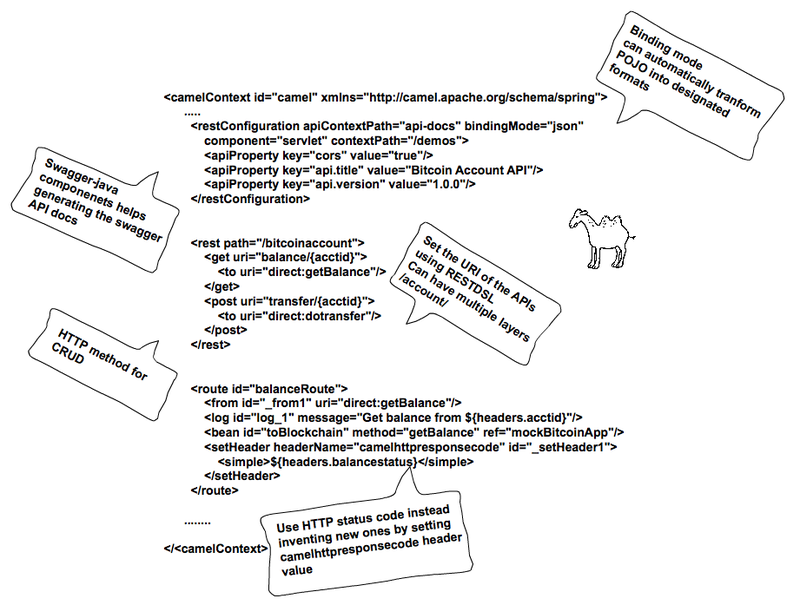 And inside the Camel context, when setting up the rest configuration, simply add the API related configuration into it.